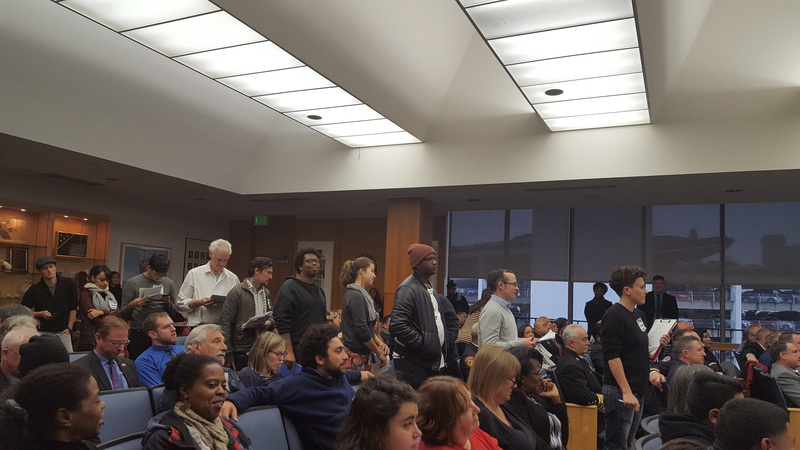 On Tuesday January 10th the Stop Urban Shield (SUS) Coalition mobilized a powerful showing of over 100 community members at the Alameda County Board of Supervisors meeting. 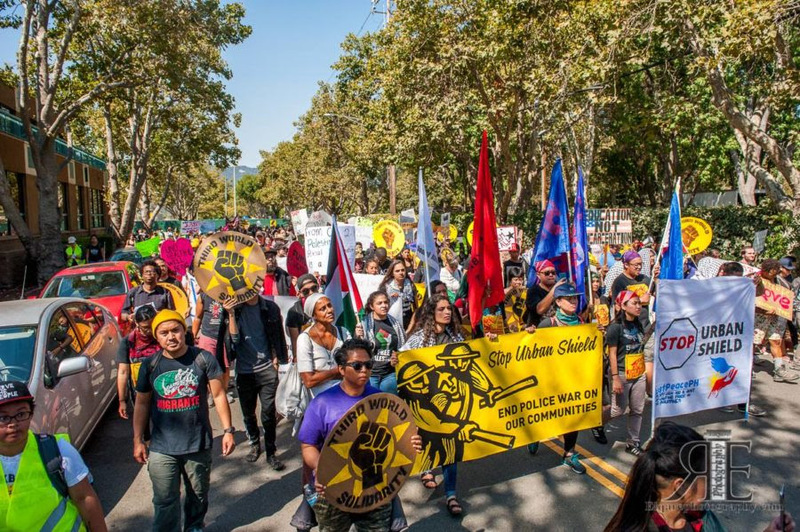 Opening with a powerful rally, the SUS Coalition had a strong and inspiring presence against the Sheriff’s efforts to continue his violent, oppressive, and highly militarized SWAT training and weapons expo. We joined forces with the Alameda County Jail Fight Coalition, which was also there in force to stop the expansion of Santa Rita Jail, and made clear that the struggles against policing and imprisonment are fundamentally linked, and must be fought in tandem with each other. For the last several months, the Coalition has been organizing to push the Board of Supervisors to refuse funding for Urban Shield. We have delivered testimony during public comment at meetings and created a report to help educated the Board on how they can shift their priorities and invest in true emergency preparedness and disaster responses that support communities. 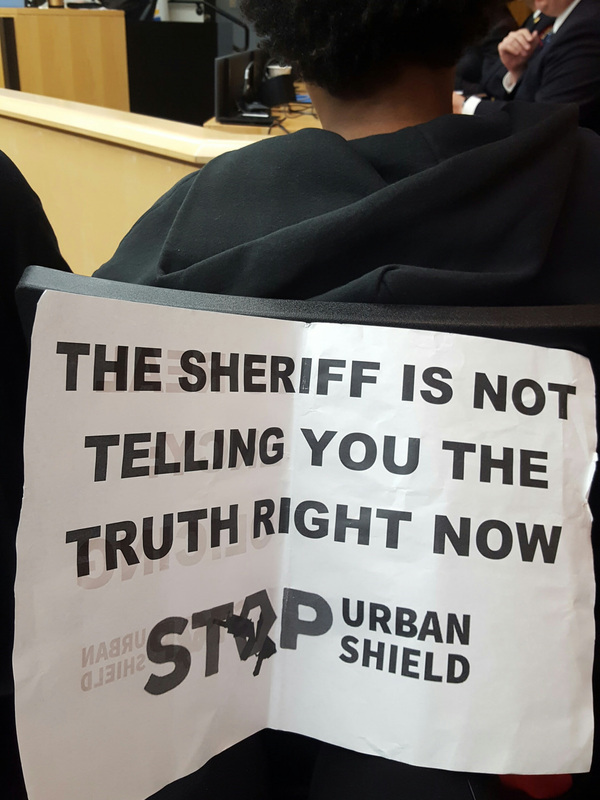 In October we alerted the Supervisors to the upcoming opportunities to refuse the Sheriff’s bid for Urban Shield funding, even though the Sheriff misled the Board, lying about intentions to receive funds to host the expo in 2018. For months we have requested meetings with each of the Supervisors to speak directly about our concerns, yet all refused to meet with us except for Richard Valle, who finally agreed at the eleventh hour on Monday. 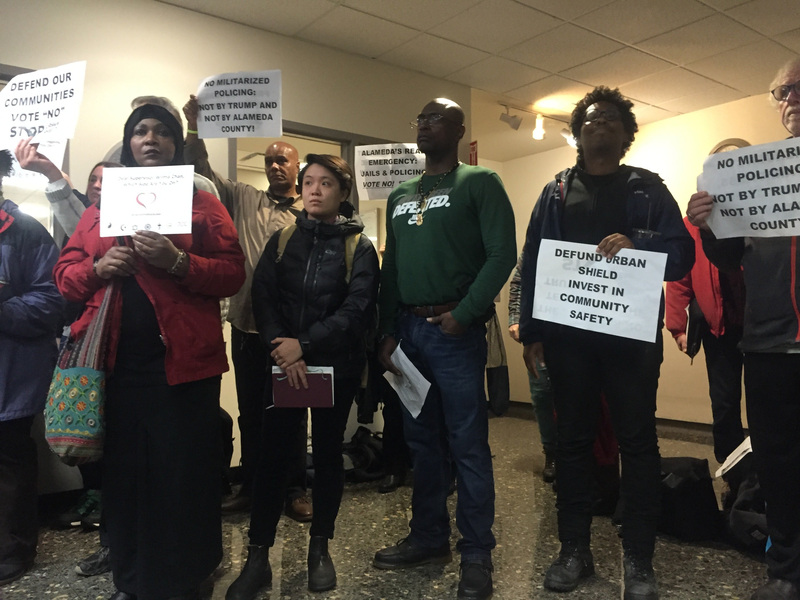 On Tuesday, over 50 people representing 30 organizations spoke against Urban Shield and gave powerful testimony on the impacts of militarized policing on immigrant and Muslim communities and communities of color (Twitter feed account here). Our testimony broadly and succinctly challenged the legitimacy of police as emergency first responders, the collusion of natural disaster preparedness and militarization, and the continuation of a program that would expand the Trump regime’s capacity to wage war on our local communities. We were coordinated in our efforts and our talking points, despite the fact that the Board refused to allow the Coalition time for a counter presentation and even cut public comment to one minute per person. We presented a petition signed by more than 1500 Alameda County residents urging the Board to oppose Urban Shield. We demanded that the Supervisors refuse funding for Urban Shield, or at the very least, postpone their decision until all of them met with us. Tuesday’s meeting revealed the power of our organizing. Due to pressure from the SUS Coalition, the Board of Supervisors requested a presentation from the Sheriff whereas in the past they have simply rubber stamped the funding. Given the threat of our efforts against Urban Shield, the Sheriff’s department felt compelled to gather testimony in his defense and lay out 2017 guidelines, including banning any vendors from the weapons expo that display racist material. Following questions from a Supervisor that the SUS Coalition delivered, the Sheriff even quickly accepted a ban on having international police units from countries with ongoing human rights violations. Though we do not believe that these guidelines will make Urban Shield any less destructive or harmful, they, along with his cabal of cops in attendance to support Urban Shield, show that he was terrified our communities were close to bringing the program to an end. Shamefully, and despite the Sheriff’s blatant lies, roundabout answers, and our show of massive opposition with a strong and clear message, the Supervisors voted to support the Sheriff’s bid for Urban Shield in 2017. Yet this campaign is not over. We’re inspired that the organizing and resistance of our communities and allies were able to put the largest SWAT training in the world completely on the defensive. While the Supervisors voted to approve Urban Shield for fall 2017, we remain committed to strengthening our fight, continuing our struggle against Urban Shield, and ultimately winning.